The best thing about living in San Francisco is that I can step out of my apartment and, without any planned route, find an art exhibition that I had no idea was happening. 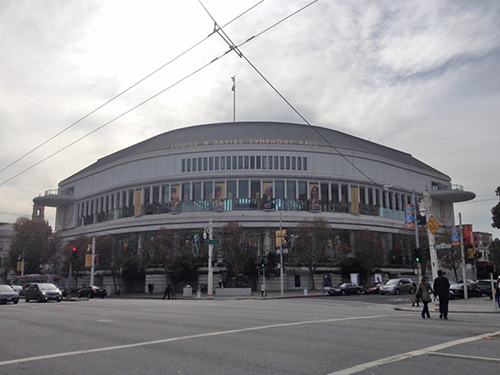 At the beginning of every month, I like to walk my rent check to my property manager’s office by the Civic Center. 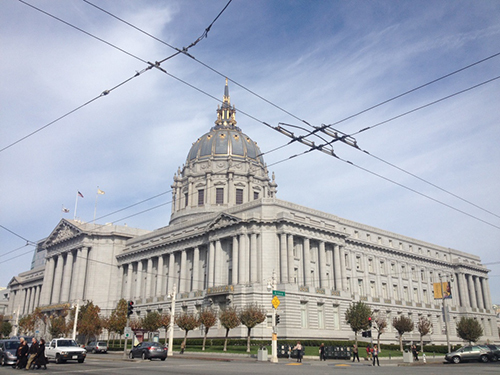 The Civic Center is a cultural crown of jewels in this city with a symphony, ballet, opera, library, and museum surrounding City Hall. 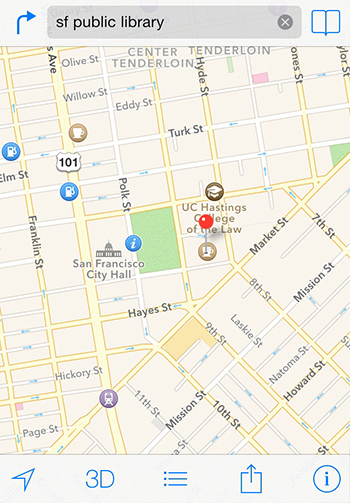 SF is so cool that the city closes the Civic Center for massive events like a concert by Deadmau5 or the 2013 X Games Dew Tour complete with a skate park and dirt bike course. 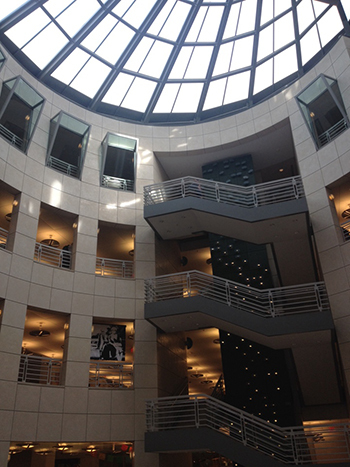 On this particular rent-check-walk, I decided to check out the main branch of the SF Public Library at the Civic Center. If you’ve seen the 1998 movie City of Angels starring Nicolas Cage and Meg Ryan, then you’ll understand this: it’s the same library that all the angels in black coats visit to read books and stand around looking creepy! 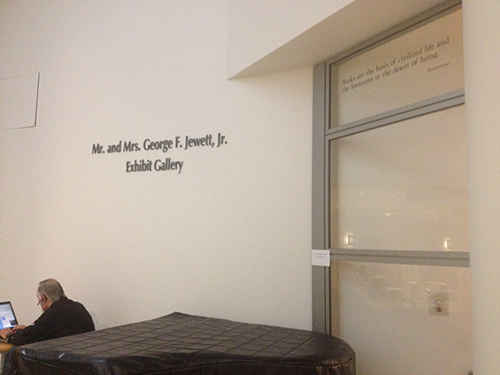 Little did I know that there would not only be one exhibition, but five! Stumbling across these exhibitions in a space like a public library brought me back to undergrad and learning about the idea of curating. 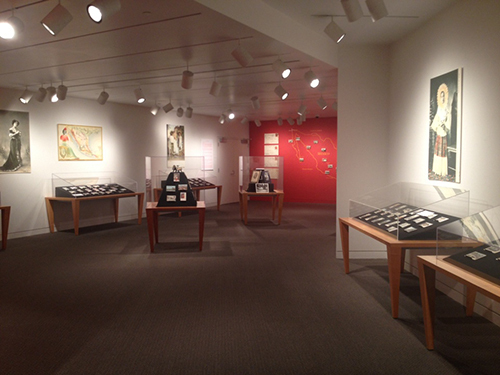 It’s an interesting position to be curating a show at a library — a local history and audience are engaged primarily with something else in the space (the books) but are somehow casually distracted, entertained, and educated by the exhibition. 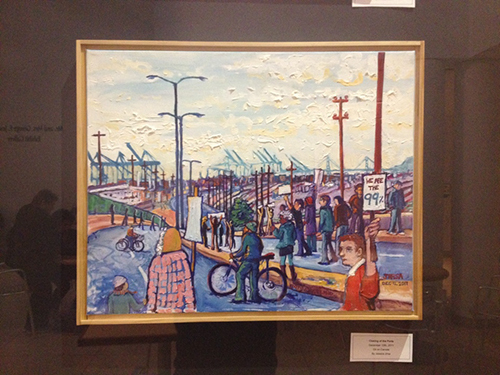 A part of the exhibition, Three Artists Witness the Occupy Movement: A Plein Air Story. The first exhibition I accidentally saw was called Three Artists Witness the Occupy Movement: A Plein Air Story. 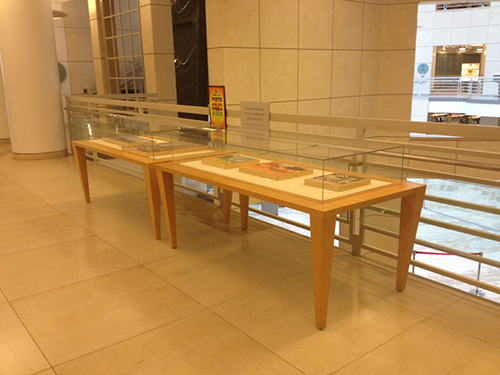 If it weren’t for the table jutting out in the middle of the walkway, I would have kept on going about my tour of the library, but I paused to see what the enclosed case had to offer. It was lovely paintings by three different Oakland artists who documented the Occupy Oakland and Occupy San Francisco events. The placard said “Exhibition continues in cafe wall display case, lower level,” so I decided to see what else was in this show. 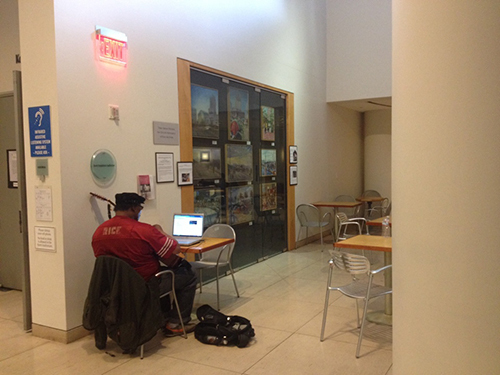 The other part of the exhibition, Three Artists Witness the Occupy Movement: A Plein Air Story. John Paul Marcelo, The Port Shutdown, 2011. Oil on wood. 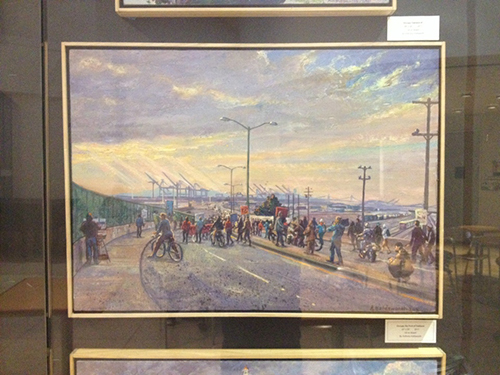 Anthony Holdsworth, Occupy the Port of Oakland, 2011. Oil on Board. 20? x 28?. 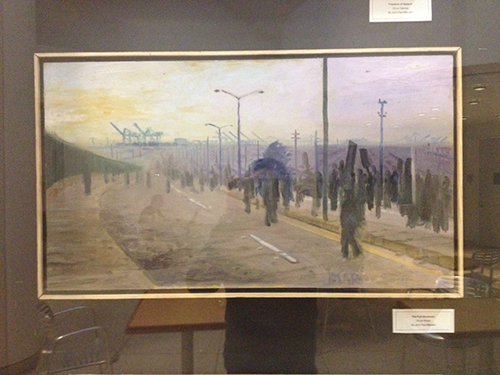 Jessica Jirsa, Closing of the Ports, December 12th, 2011. Oil on Canvas. The painting show was a lot of fun. 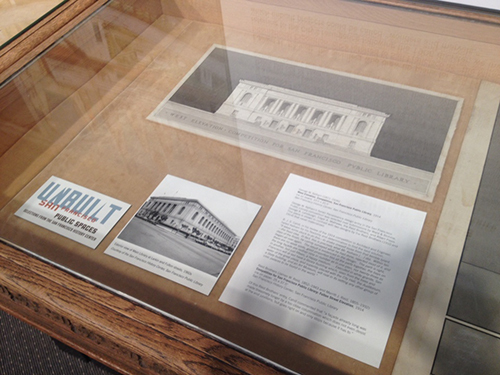 It’s unclear who curated the show based on the text provided, but a little googling on the Internet leads me to believe that the show was originally presented as Occupy: The Plein Air Story and curated by Eric Murphy at Oakland’s Joyce Gordon Gallery last November. This exhibition cleverly puts three different artists side-by-side for a comparison of the same subject depicted in varying styles. John Paul Marcelo’s The Port Shutdown is an eerie march of shadowy dark figures, Anthony Holdsworth’s Occupy the Port of Oakland (2011) is a bright pastel palette of folks walking towards the sunlight, and Jessica Jirsa’s Closing of the Ports (2011) is a colorful cartoon-like gathering of characters. 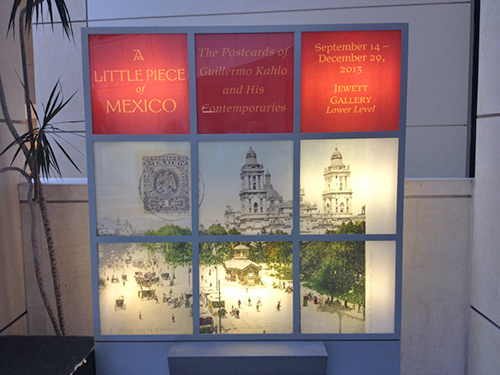 After looking at the painting show, I turned around to discover the Mr. and Mrs. George F. Jewett, Jr. Exhibit Gallery and an exhibit titled A Little Piece of Mexico: The Postcards of Guillermo Kahlo and His Contemporaries. In a place like a library, the contributing parties to making the show possible are a paragraph in itself. 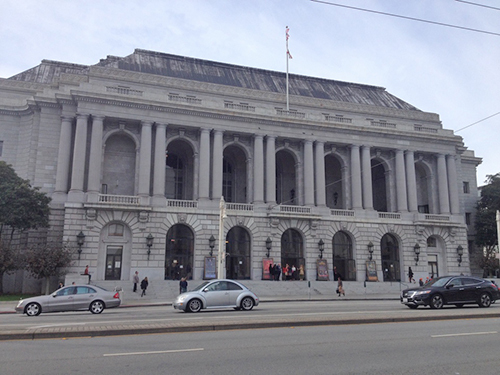 Here’s who is billed as presenting the show: The San Francisco Public Library, the Consulate General of Mexico in San Francisco, the Department of Latina/Latino Studies in the College of Ethnic Studies and the Office of Research and Sponsored Programs of San Francisco State University, and City Lights Foundation. Wow! 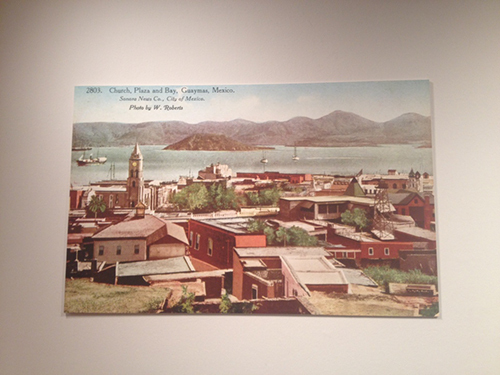 The exhibition makes a fantastic case that the cultural identity of Mexico was shaped by the popularity of the photo postcard at the turn of the 20th century. With images from international photographers like Guillermo Kahlo, Abel Briquet, F. Leon, and CB Waite, the exhibition honors the iconic images that undoubtedly shaped the current contemporary branding of Mexico’s visual identity. 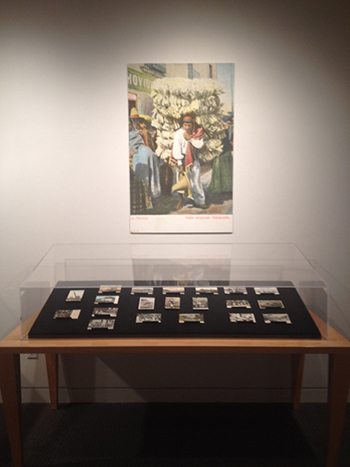 The significance of this show to the local Mexican and Mexican-American population is palpable, while also revealing the country’s heavy influence on San Francisco’s own architecture and landscape design. As I walked upstairs to check out a show about tennis, I noticed another show with fabulous architectural renderings. 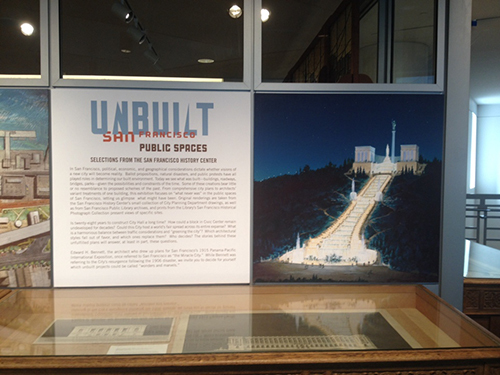 An exhibition titled UNBUILT: San Francisco spans five venues throughout the city and presents proposals for various buildings and urban spaces within the city that were never realized. My dad is an architect, so genetically so am I, and so this show was really interesting to me. Architects also have the best handwriting in the world, so there’s something about architecture and text that is always aesthetically amazing. As a resident and avid walker of SF for almost five years, I genuinely appreciated seeing these renderings and sketches for spaces that I’ve come to call home — it’s like walking into an artist’s studio or flipping through your old sketch book and seeing thoughts and ideas for past work that just never made it off the page. 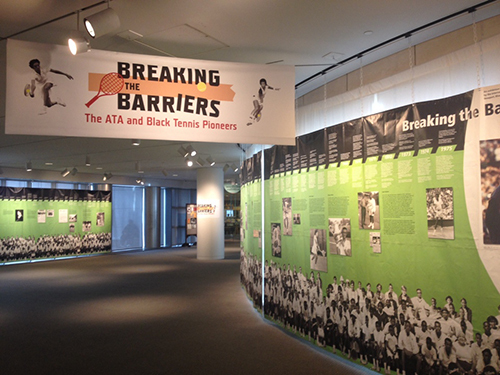 Finally, and coincidentally enough for me as a blogger for a blog called Bad at Sports, there were two exhibitions highlighting sports — They Were First: African Americans in Sports and Breaking the Barriers: The ATA and Black Tennis Pioneers. 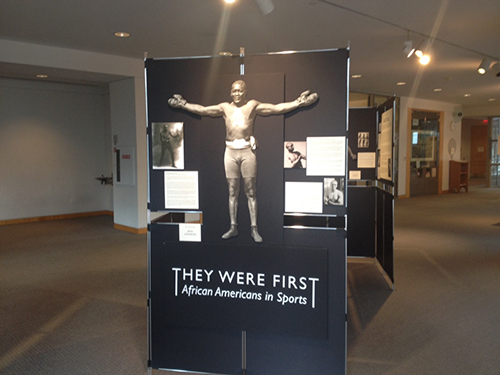 Both exhibitions provide a more historical context (rather than visual) of the obstacles and triumphs of a marginalized group of athletes. 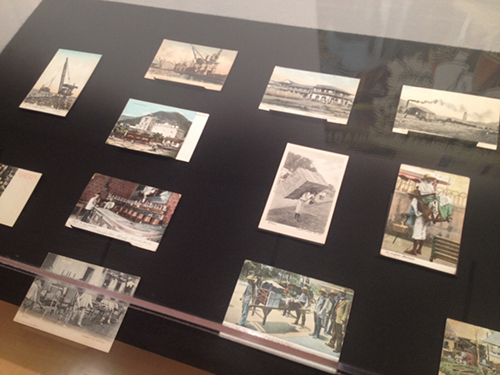 Simple timelines line the walls of the library with photos and text reminiscent of a history museum show or even the waiting lobby to the “Soarin’ Over California” ride at Disneyland. Adena Cartsonis, age 9, 2nd place winner for 7-11 category. 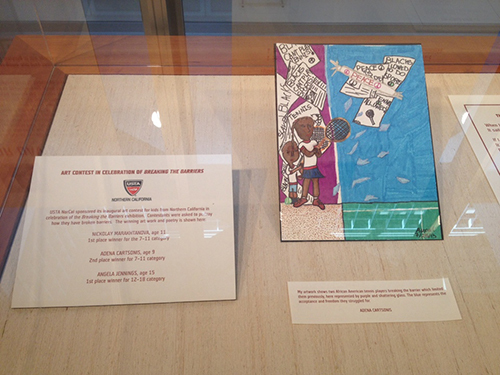 The best part of this entire SF Public Library multi-exhibition day was seeing artwork from the winners of an art contest for kids coinciding with Breaking the Barriers. Northern California kids aged 7 to 18 were asked to portray how they have broken barriers. As cynical as I’ve become now that I’m 30, there will always be a special place in my life in memory of the art opportunities I got when I was a kid. Growing up, my suburban New Jersey town offered plenty of art opportunities for kids that I completely devoured: art classes at school, annual art exhibitions at the mall, and contests for different purposes like a banner at an elementary school or the yearbook cover or the town’s New Year’s Eve celebration logo. How many high school students enroll in AP Art or go through the lengthy submission process for a college art application? It’s awesome that the library exhibition included this artistic component for the local kids, and its something I believe will be a special introduction for every participant, especially the winners. Watch out Hugo Boss Prize 2035! Conclusion? Who knew a day at the library could be so fun and artsy!